The countdown is real. Baby Girl could arrive any day. The estimated due date is August 15, but we know she will arrive before that because the doctors aren’t letting her go past her due date (risks associated with Down syndrome) and that day falls on a Saturday. So, if she doesn’t arrive before the 13tg, then she’ll be induced that day. All that to say… oh my golly!! She’s coming!! After six years of waiting for another child, my excitement, joy, and anticipation is palpable. Just ask my family and local friends. The second I see her, I just know I will melt. The moment Paul and I hold her and look at each other…. well, it’s going to be just as magical as it has been six times previously we’ve fallen in love with our child. We will keep her name and her face private for a few days. This won’t be easy for someone like me: a person who lives life out loud and seriously loves sharing with people, especially those who care so much. But I love MH more. So, since New Mexico gives her three days to be the mom before she can sign her relinquishment papers, I want to honor those three days by not sharing photos or announcing Baby Girl’s name. Yes, I will get to nurse her and swaddle her… and beyond all awesomeness, Lord willing that she is fine during labor and delivery, I will get to do immediate skin to skin with her. Yes, I will be caring for her from the get go. Yes, I will be her mama in my heart and in MH’s heart. But…. these will be the only days that MH is the mom, legally. It just doesn’t feel right to share photos as a mom while MH is still the mom. No matter who is doing the care giving. MH will have some time alone with Baby Girl during those days. It’s something they both deserve and need. MH will speak with her privately and lovingly. So, please know that I will announce on Facebook and Instagram that labor has started and that Baby Girl has been born. I will also certainly share prayer requests, if they are needed (you are praying that she has little to no complications, right?). I will share my joy. I just won’t publicly share Baby Girl as our daughter until she (mostly) is. As a reminder, read this post about how everything should play out and the legal steps we must take to get to Baby Girl being completely ours, legally. I want to thank you all for walking this journey with us, for caring for us, for being supportive of us. All of us. Your kind words, pms, and prayers are precious to us. We don’t have much longer, but the hardest time is ahead. I can’t even begin to describe the range of emotions and surreal experiences we are about to walk individually and as a set of long time friends. One of us will become a mother for the first time and then will place her only child into the arms and family of the forever mom. One of us will watch a friend give birth and then will be given the most amazing gift of a lifetime. I seek the Spirit as we live our surreal life, but especially for the most difficult season of this journey. Please don’t stop praying for us. 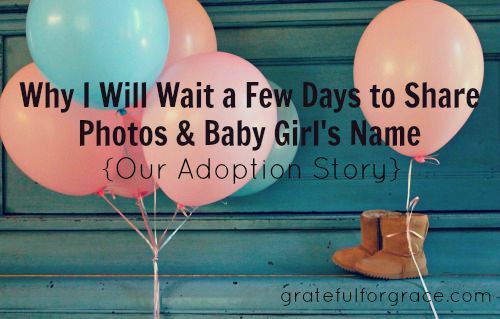 And… look for the day I can share Baby Girl’s face and name!